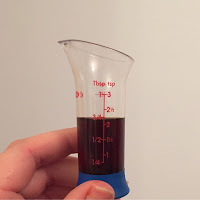 So this post is going to be about somethings that people ask me about in my kitchen adventures and some recommendations I have. The first area I want to focus on in preparation of sorts. This comes down to a couple of things: reading the recipes, miss en place, having a game plan. I know that I'm doing the 366 recipe challenge - but I have always loved to cook and tend to go all out for large occasions. I have been known to do multiple courses for a kids birthday party. So my first part of the plan comes down to figuring out what I am going to make and then making copies of the recipes. Yup - that is right even when I have cook books - if I am making multiple dishes I will make or get out my copies of the recipe. I do this for several reasons. The first reason I do this is because the last time I didn't I had to flip back and forth between three different recipes in the same book. I also find it difficult to balance multiple cook books on the counter. The second reason I tend to like to have all of the recipes up on the wall so that if someone is helping me with larger events they can also take a peak at the recipe easily while I may be working on something else. Last reason comes down to scaling up or down a recipe. If I have something that makes a different quantity than I need and I am making multiple dishes I will write down the new measurements for whatever I need on the recipe so I don't have to think about it when I'm working (I have forgotten to double something on occasion). I next read all of the recipes as best as I can (and I continue to learn the importance of this every day - oh panna cotta). After I read the recipes I make a master list of ALL items needed and the quantities for something across all of the recipes (so let's say I don't run out of garlic because I need three cloves in everything I'm making). After that I narrow down what I actually need to buy. Following this - I pay attention to how long the recipes say I need to prepare or cook something. This becomes important in multi tasking. For example if I have to boil potatoes for 20 minutes - I can do that while cutting/chopping for something else and then something can be working away in the oven. 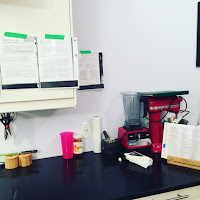 Usually my big master lists are saved for Christmas - where I have a three day plan typed out and taped to the kitchen cabinets with time lines of when things need to be started, where they are being cooked, what they are being cooked and serving dish is being used. This is less of an issue now that I have my wonderful double ovens. However, it is still a good idea make sure you have everything ready to go. One of the biggest tips I read in Gordon Ramsay's Ultimate Home Cook Book was not to have everything ready at once - so don't time to have the potatoes, turkey and gravy done at the same time. Certain things can sit and keep hot until ready to serve - other things need to be served right away. So I'm working on that aspect of planning - what can be done early and kept until the other things that have to be served right away are done. Once I'm ready to go I do put the recipes in page protectors and using painters tape - I put them up on the walls, cupboards...basically anything that doesn't move and where it's fairly easy to see. It helps to have them right there. I have two more recent purchases that I want to share as I find them really useful. 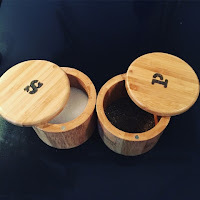 The first is the "salt" containers (I am using them for Sea Salt and fresh ground pepper). They are bamboo and have tops that swivel open really easily. It is nice to have them on the counter to be able to add salt and pepper to things as I am cooking. I got this set at Bed Bath and Beyond but haven't been able to find them anywhere else locally.